This morning’s Meet The Press featured, for the third week in a row, Republican presidential nomination candidate and former Speaker of the House Newt Gingrich. He was fresh off a surprising win in the South Carolina primary (and he was wearing a different tie than the one he wore on the previous two appearances). Gingrich said his two takeaways from South Carolina are that there is real economic pain in this country and the level of anger at the “national establishment” (particularly the elite news media) is very high. In a clip played from last night, rival Gov. Mitt Romney (R-UT) criticized people who are “demonizing” his success at Bain Capital. He said people who do so are using the “tools of the left” and are not fit to be the GOP nominee. Gingrich responded that Romney is using tactics no high school debater would let stand. “Questions about the character, judgement, and record of a presidential candidate is not an attack on business. That is silly,” said Gingrich. Gingrich said, “Beating Barack Obama has to be the number one priority for Republicans.” And exit polling in South Carolina showed many think Gingrich is now the most electable. But, as Meet The Press Host David Gregory pointed out, the newest Fox News poll shows Newt Gingrich’s favorable rating nationwide is 27% with unfavorable at 56%. In response to a question about his personal character, Gingrich twice mentioned that he is 68. This did not reassure me. Underlying much of the conversation today was news that Romney will be releasing his tax returns for 2010 and 2011 this coming Tuesday. 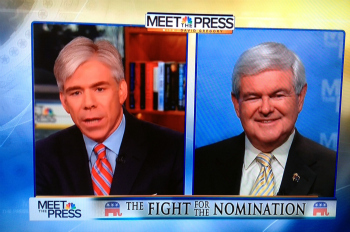 While Gregory did let Gingrich and the next guest, Gov. Chris Christie (R-NJ), respond to this, he didn’t ask either of them about the timing. Romney first said he would do this in April, so is it a sign of trouble that he is doing it now? And should we read anything into the fact that he is waiting until the day after the next presidential debate for the release… a day which also hosts the president’s State of the Union address? Christie said Romney’s second-place finish in South Carolina was disappointing, but he still believes Romney will be the Republican nominee. Gregory’s questions to Christie in this segment were surprisingly soft. One was about how Romney can better communicate, and the next was, “What has been Mitt Romney’s greatest contribution to the conservative cause?” Questions like this just open the door for a stump speech response, and that is what we got. The next question at least had the potential to elicit something newsworthy: “Do you think Gingrich will embarrass the party?” Gregory then tried to pivot this to the personal character issue, but Christie did not take the bait. On the big (yet obvious) question, would you accept the vice presidential spot on a Romney ticket, Christie said he would listen if Romney called, but he fully expects to stay as governor of New Jersey. Out of nowhere, an actual governance issue of importance to the country made a fleeting appearance. Gregory asked if there was anything President Obama could say in the State of the Union speech that might bring the parties together to accomplish something meaningful even in an election year. Christie said, “embrace Simpson-Bowles,” the budget deficit reduction plan commissioned–and then shelved–by the president. The interview ended with Christie predicting the “New Jersey Giants” will win today’s NFL playoff game and head to the Super Bowl. On to the roundtable, where NBC political director Chuck Todd said South Carolina exit polls show Gingrich is becoming the single conservative alternative to Mitt Romney. MSNBC’s Joe Scarborough, a former Congressman with no love lost for Gingrich, says Gingrich is not really a conservative, he has flip flopped, and talk of a brokered convention will now ratchet up. Republican strategist Mike Murphy says Romney has been playing defense for several days, and that doesn’t work for him. Scarborough again, Gingrich sold us conservatives out in Congress in 1998, he is not a conservative, he is an opportunist. “But here is the problem: So is Mitt Romney,” added Scarborough. Murphy dismissed the idea of more candidates joining the field, but Scarborough wants to have some fun with this. He floated the name of Gov. Haley Barbour (R-MS) as a potential nominee, and he spun out a “favorite son” idea where many different candidates stand in their own states as a way of forcing a brokered convention. Todd also dismissed the brokered convention and the idea of new candidates joining. But he thinks all of these developments raise the likelihood of a third-party run for the White House.